Brown creepers (so called because they “creep” up the sides of tree trunks in search of insect eggs and other food) are new birds to me, despite that they live in all forty-eight contiguous United States and Alaska. That’s because these little birds are easy to miss. Smaller than most sparrows, with feathers that blend into tree bark, and capable of moving several yards in the time it takes you to blink, they can be difficult to spot unless you are up close or happen to be looking for something else through a pair of binoculars and manage to accidentally spot one. They came to my attention earlier this autumn when I was hanging out on my porch with a pair of binoculars, pointing them toward any bird call I managed to hear. Despite their petite size, these creatures have a distinctive call: a loud, high-pitched whistle, “Twee twee,” certain to get your attention if it’s within your hearing range and you’re tuned in to that kind of thing. The call is what led me to spot my first one. I had no idea what it was, and grabbed my camera so that I could follow it around the backyard. I shot a bazillion pictures so I could later compare it to the photos in my Birds of Wisconsin Field Guide. 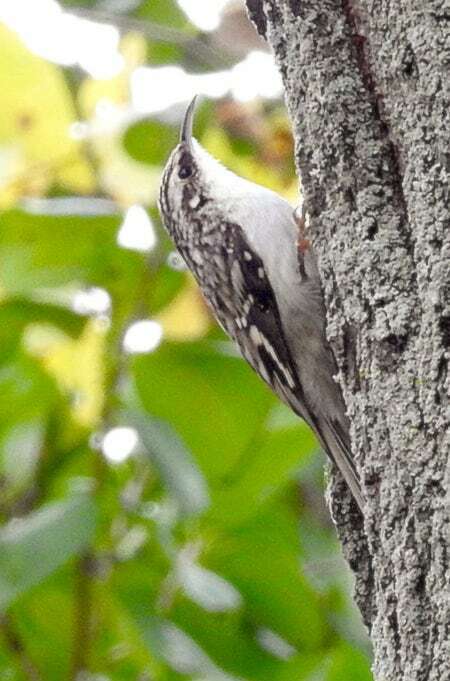 Want to hear the call so you can spot a brown creeper of your own? You can find several song and call samples on the brown creeper page of the Audubon website (bottom right corner). Then learn about more birds from North America and Madagascar by browsing my birding posts.